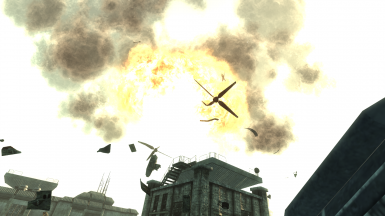 This mod fixes the bug found in (at least some) PC installations of Fallout 3 - Broken Steel. The fix was found, but not created, by Genocidal Cry on the www.gamesas.com. Tesla Cannon now correctly one shots any vertibirds. This mod does not increase the damage output of the Tesla Cannon, it only repairs a broken mechanic. Thus, the overall damage output of the Tesla Cannon remains the same. Broken Steel - Obviously requires the official Broken Steel DLC. This is accomplished by extracting the modified vertibird meshes from the Broken Steel BSA to the DataMeshes folder. 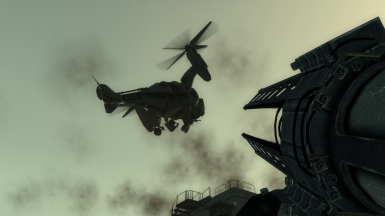 This correctly overrides the default vertibird models used in the game, which were not compatible with the script causing the vertibirds to explode. Credits for finding the fix go to "Genocidal Cry" on www.gamesas.com. Okay, coming down the home stretch for my pre-FONV playthru, and... my Tesla Cannon is not popping vertibirds in one hit. I'm patched up to 1.7.03 plus FOSE, and I've tested with my personal private tesla boost mod disabled, but still nothing. No vertibirds dropping out of the sky. Is this a known issue? Is there a fix? Is there a known instance of a mod causing this? EDIT: Okay, I traced it to a weird reason... something decided to stop working. If I shoot one of the nearby laser turrets, it properly triggers "Trigger Object Found", and "Failed to blow up vertibird". If I shoot a vertibird... nothing. I figure nothing happens when shooting the vertibird because it is somehow not causing the OnTriggerEnter block to run (meaning the "no trigger object found" is extraneous). So.... Why aren't vertibirds triggering it anymore? It checks out if I do IsInList to the DLC03TeslaExplosionList on a vertibird. The vertibirds will also explode if I manually use DamageObject (longhand for the "do" command) on a vertibird for the amount in the script So what happened? So... ignore this post. Or remember this in the event that you ever hear of this problem in the future.